Today’s reagent is a staple of Org 1 and the key representative of a genuinely useful process being used every day in laboratories worldwide. It helped secure H.C. Brown the 1979 Nobel Prize (along with Georg Wittig, whose eponymous reaction should be familiar to those in Org 2). I’m talking about BH3 (borane). Although we commonly just write “BH3” to describe its use in reactions, borane actually doesn’t generally exist as BH3 per se. If you recall that boron only has 3 valence electrons, this means that any neutral compound of boron will lack a full octet and therefore be Lewis acidic (i.e. able to accept a pair of electrons). Two molecules of BH3 tend to associate with themselves in an interaction I’ve heard crudely described by the formula “x = 70-1” , giving B2H6. Alternatively BH3 readily forms stable compounds with Lewis bases such as tetrahydrofuran (THF) and dimethyl sulfide among others. So it’s quite possible that you’ll see BH3 in these forms as well. It all amounts to the same thing for our purposes. Finally, there are other “boranes” such as disiamylborane- in which one or more of the hydrogens is replaced by an alkyl group. These can also do hydroboration. The most important use of BH3 is for the hydroboration of alkenes and alkynes. For the reaction of alkenes, there are two important things to keep in mind. The reaction is selective for the less substituted alcohol (regioselective). This is usually referred to as “anti-Markovnikoff” selective. Furthermore, the reaction always produces the product where the new H and OH are syn to each other (stereospecific). The reaction of BH3 with alkynes always throws people off. The oxygen still ends up on the less substituted carbon, but now it looks like not one but two C-C double bonds have disappeared! This is usually the first introduction to the concept of “tautomerism“, and causes a fair amount of angst. In fact, BH3 *did* only add to one C-C multiple bond, but the product has just adopted a different form (More below). This ‘anti-Markovnikoff” selectivity issue with BH3 causes a lot of stress too. It actually involves no new concepts! This has come up before, in “the most annoying exceptions in org 1“. Take a “Markovnikoff” selective reaction like the addition of HCl to an alkene. Which is more electronegative, H or Cl?. Cl is (Cl: 3.0, H: 2.2). The more electronegative element lines up with the more substituted end of the double bond. BH3 is weird because it’s actually the H which is more electronegative! (H: 2.2, B:2.0). Therefore, since H is more electronegative it actually ends up on the more substituted carbon. Note that hydroboration can happen up to 3 times with BH3, since there are 3 B-H bonds. 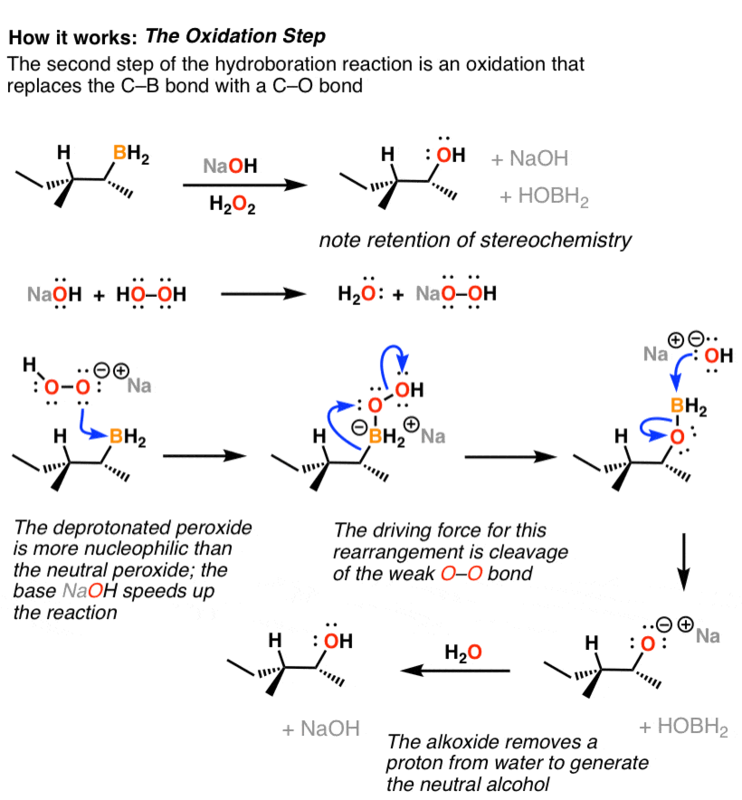 Here I’m only going to show it doing one hydroboration, but the exact same steps apply for subsequent hydroborations. Another thing which throws people off about hydroboration is drawing out the mechanism for going from the hydroboration product to the alcohol. There are a lot of moving parts here, it is true. One key point to remember: the OH goes exactly where the boron was, without changing the stereochemistry. The two reagents added (NaOH and H2O2) each play a vital role. There are 4 steps. 1) In the first step, NaOH removes a proton from H2O2, which makes it a better nucleophile. 2) The resulting conjugate base of H2O2 then attacks boron. 3) This sets up the third – key – step, which is rearrangement – shifting of the C-B bond to form a C-O bond, breaking the weak O-O bond in the process. 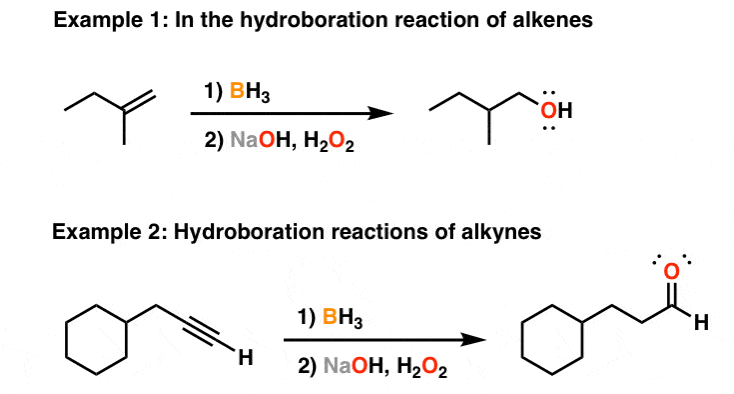 In the third step, OH attacks the boron, which releases the negatively charged alcohol (called an alkoxide). A lot of people have a hard time drawing this when they start out. Don’t forget to draw the ugly version first. 4) Finally, protonation of this with water leads to formation of the neutral alcohol. In the reaction of alkynes, the 4 steps are the same. The difference is that the alcohol formed – half alkene, half alcohol (hence enol) is in equilibrium with a constitutional isomer – the aldehyde. 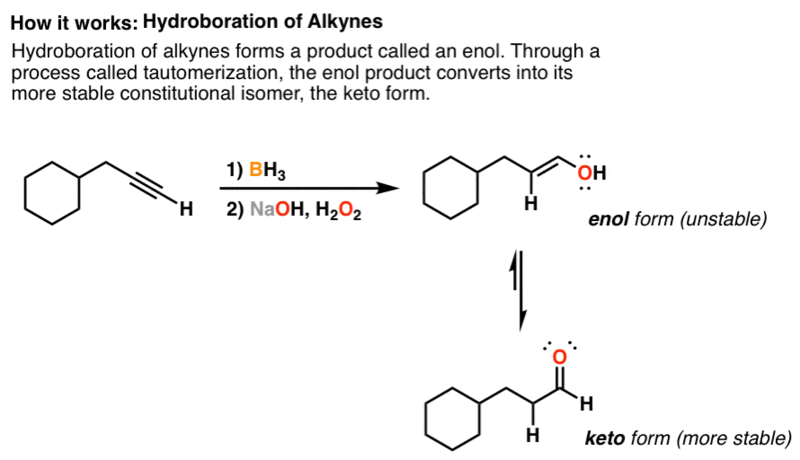 This relationship is called keto-enol tautomerism and it comes up a lot in Org 2. In general, keto-enol tautomerism favors the keto (C=O) form by around 5000:1, but this can vary considerably. P.S. You can read about the chemistry of BH3 and more than 80 other reagents in undergraduate organic chemistry in the “Organic Chemistry Reagent Guide”, available here as a downloadable PDF. It wasn’t mentioned because it’s often not covered in introductory classes. If you’re looking for more advanced material there are many great resources out there – SANROS and the Portable Chemists’ Companion to name just two. In the oxidation step of the reaction, why does the hydroxide ion attack the boron, to form the alkoxide? Isn’t the alkoxide a slightly stronger base than the hydroxide? What does the reaction of borane-thf and water look like? For our hydroboration-oxidation lab we had to dry our glassware and I suppose it is because borane-tetrahydrofuran would react with water molecules. Will you indulge me with a mechanism for this reaction in response?